I have always been partial to a lapcat, and most of the time, you can tell right away if a cat is partial to laps. 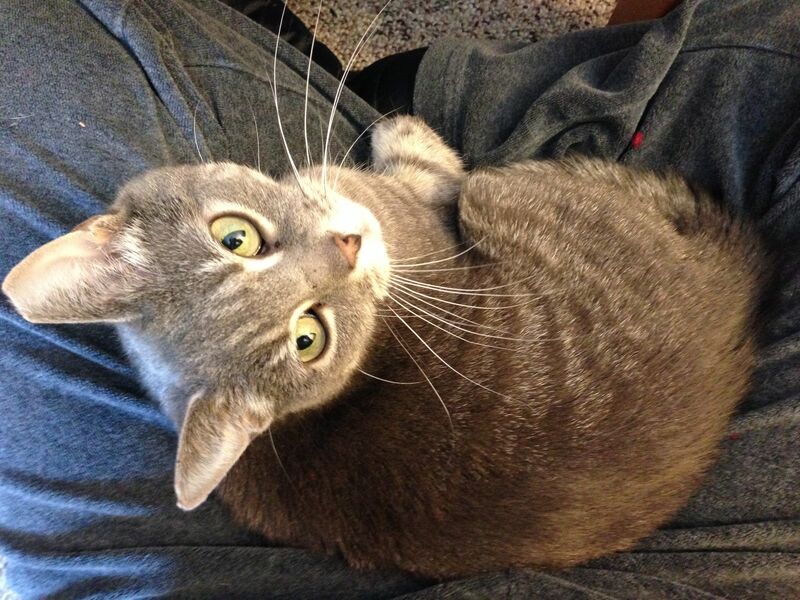 Some cats only want to snuggle up next to you, NOT in your lap. Others want to sit nearby without touching you. Usually they don’t change their preferences over time, but Winnie did. At first she was too scared to come close. It took her many months to get over her previous experience. But now, as soon as I sit on the floor, she insists on climbing into my lap. Not if I sit on the couch or lie on the bed. Only if I’m on the floor. What a pretty wee face she has LM. Thank you! Yes she does. She was a bit traumatized by the change in routine and the cat sitter, while we were gone. A scaredy-cat! Awww, Winnie is gorgeous! Love the angle of that picture too. Last summer we got a kitten from the animal shelter and we picked her specifically because she immediately climbed into our laps. I love lap cats. 🙂 Our older cat is definitely a snuggle-next-to-you cat although recently he has very occasionally come onto our laps as well. yay! Yes! I very much believe in adopting shelter animals! Our older cat (he’s 10) is a shelter cat as well. We got him as a kitten at the time so that our other scaredy-cat cat (who had lost her twin sister a year before that) would not feel threatened. Alas her motherly instinct never developed and she was scared of the kitten trying to play with her. She learned to tolerate him in time, though, and the last few years of her life even would lie beside him on the couch, oh miracle of miracles! Although, that may have been because she was going senile and in the end wasn’t afraid of anything anymore, not even the vacuum cleaner.. 🙂 Our older cat is such a sweet social animal, I believe he would have done fine with another older cat after scaredy cat passed away. If my daughter hadn’t insisted on a kitten I’d have gone for an older cat as those are generally more difficult to place than kittens. But we got a kitten instead (pitch black – is it really true that black cats are hardest to place?) and she and older cat have become good friends and play with each other every day, which older cat was never able to do with scaredy cat before. All is well in the adopted cat world! Yes, I believe it is true that the black cats are hard to place, though as you say, kittens are easier than adult cats. All ours have been adults though I confess to bouts of kitten lust! We have one who is very elderly now and her deafness makes her less concerned about the vacuum cleaner–LOL! My cats seem to be chest cats, stretching out or curling up on me when I’m in a prone position in bed or on the sofa. My first cat was very tiny, so it was no problem. Once he died, his companion, weighing in at an incredible 19 pounds, tried to take his place. Mulligan, my Mexican cat, will drape himself over me – he weighs only about 8 lbs, but he prefers snuggling at my side to watch the computer screen – or obscure it. All of these cats would cuddle up near me for a nap – but not one of them ever sat in my lap. So, even if you have to get on the floor for this pleasure with Winnie, it’s probably worth it. Yes, I have had lots of cats who were not lappers, so I am trying to encourage her! A chest cat is very funny, especially a 19 pound one! LOL. It is funny how they always want what the other one has. Prime real estate! My Oliver – 16 pounds, is definitely a lap cat but typically he has to drape himself over me. Cora likes to snuggle in the bed, but doesn’t want to sit with me on the couch. Oscar, who was feral, will probably never be a lap cat of any sort, but he adores pets in the kitchen, or while I am folding clothes. He’s very particular about his pets… Winnie is adorable! It is wonderful that he adapted so well to being indoors! You rescued him young enough to make the transition. All our cats are indoor cats now, and I have found it to be true that cats don’t mind being inside as long as they have plenty of attention (and windows). Although I gave a scruffy shelter kitty in desperate need of a home to my daughter for her 16th birthday a few years ago, the cat has definitely taken much more of a shine to my son–who’s now 16. The difference is astonishing in that my daughter simply says things to the cat like, “Oh, my god I want to eat you and squish your tiny brains out with a massive hug,” and cannot get near enough to even pet her versus my son who says nothing, but she will leap into his arms and bare her belly. Talk about keen animal instinct, eh? It’s funny how they have their own well-defined personalities and distinct preferences, even though their brains are the size of a walnut. Winnie says thank you; she enjoys compliments!